Most Promising Newcomer – CADBURY’S CARAMEL BISCUITS. A little contrived, but combining a biscuit with a much-loved chocolate bar. 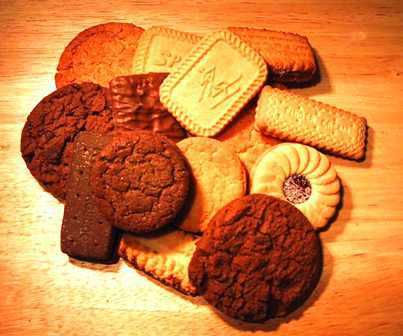 Best Dunker – The GINGER BISCUIT in its many guises and names. Perfect as a treat with a nice cuppa. Best Stand-Alone Eater: THE CHOCOLATE DIGESTIVE. Can be dunked, but with sometimes melty, messy consequences. Most Versatile: THE CHOCOLATE CHIP COOKIE. Hard to say whether it’s better dunked or as it is – but always very more-ish. Most Boring: THE RICH TEA BISCUIT. Slightly preferable to cardboard. The “Whatever Happened To?” Award: THE HOBNOB in its various guises. Innovative in its day, but messy and prone to break the teeth of the unwary. Most Addictive: CRINKLE CRUNCHES. Once you’ve had one, the whole packet has to go. Lifetime Achievement Award: (i.e. for a biscuit which you would only choose if there were no others left or as a gift for others, yet which has managed to hang around forever) THE NICE BISCUIT. That concludes the Annual Biscuit Awards. All decisions are final and the judges are unable to enter into any discussions as to the merits of the various winners, other than with those who have paid to have an entrant mentioned. Aside | This entry was posted in Uncategorized and tagged biscuits, cabdury's, cadbury's caramel, chocolate chip cookie, chocolate chip cookies, chocolate digestive, crinkle crunch, digestive, ginger, ginger snaps, hobnob, rich tea, rich tea biscuits. Bookmark the permalink.